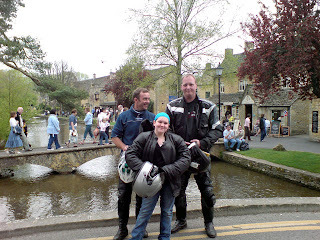 Finally Neil has managed to get the Yellow Belly on the road so we celebrated with a trip to Bourton-on-the-Water, riding at what Neil described as a "sustainable pace". Having said that, this description only came to light later on after a couple of beers down the pub. A "sustainable pace"? Isn't that something you aim to achieve on an all day drinking binge? 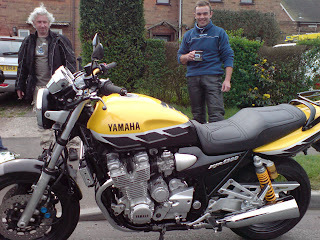 Neil's Yellow Belly sporting one of Loz's home made Givi Luggage mounting racks. No bike should be seen without one! 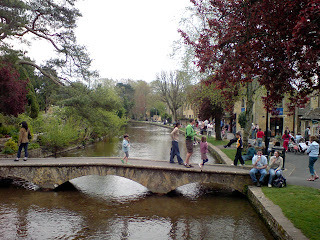 Anyway, after a tedious slog down the M42/M40 we turned off onto the A429 in the direction of Bourton. After a few roundabouts that were, according to Neil, taken at "impressive lean angle" (again, beer induced conclusions) we were greeted with some fine twisty bends that put more than the odd smile on our faces. I remember riding down this road last year and not enjoying it but now I've had another go at it I've changed my mind. Loz with his daughter Ebony in Morton-in-the-Marsh, and Yellow Belly in the background. 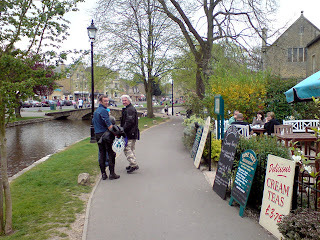 A jangle wouldn't be a jangle without some food along the way so we plumped to eat at the Mad Hatter Tea Shop on the banks of the river. 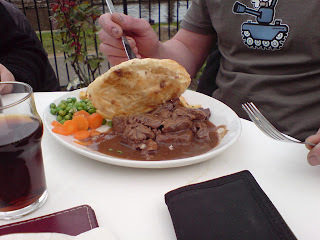 A fine beef in ale pie with chips, peas and carrots. Apparently this was supposed to be an omelette. I'm surprised they've never been prosecuted under the Trade Descriptions Act! Not good at all. And if that wasn't bad enough, a bird decided to poop straight onto our table. Had it have landed on the omelette it might have added some flavour! That sort of wraps up our day. There's not a lot else to say really apart from we managed to avoid the motorway on the way back which was an altogether much pleasanter experience. Those last few pictures would make great postcards...it looks like a beautiful place. Miss U - Pathetic is a good summary. 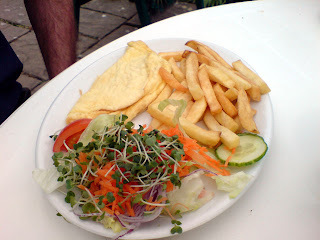 So Tenerife is obviously the omelette capitol of the world. Paddy - I'm doing it, I'm doing it right now...... The air guitar. What a beautiful place to pause for thought, and a bit of drink inducement of course! 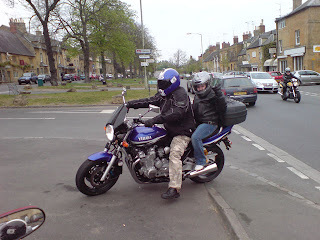 Have finally had a couple of ride outs on hubbys bike now the weather is warmer, it's great, roll on a long hot summer! I can't believe I missed you one year anniversary! So, a bit late, but I get there in the end, HAPPY BIRTHDAY. Ali - Drink inducement? I take it you're referring to a nice cup of tea? I didn't know your hubby had a bike. He's obviously a top guy! Don't worry about missing our anniversary. There's still some beers in the fridge if you want one. He has a gorgeous bike!! For a couple of years he had been saying he wanted to trade his then sports bike in as he was getting too old to be racing on the road, and what else could you do when sat on a sports bike!! 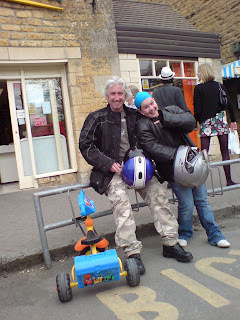 I wasn't so keen to sit on the back of a 'sit up and beg' bike, but it's the best bike he's ever owned. 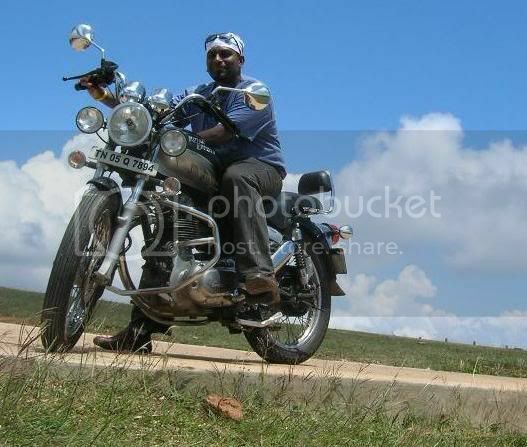 His dream, of course, is to own a Harley, but as dreams cost a lot of money he settled for the current one. Did someone say there was beer left??? Point me in the right direction! 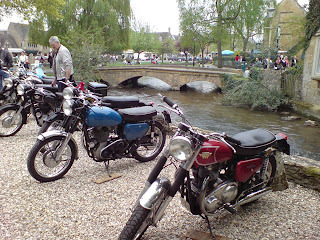 the matchless looks beautiful..they've been well taken care of. So the beer is still in the fridge? 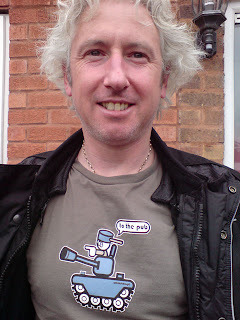 I remember a distinct lack of it on the actual day of the celebrations! 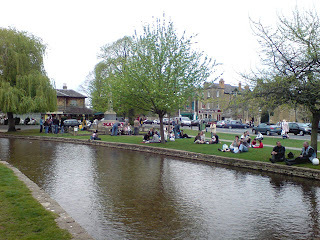 Bourton-on-the-Water is such a lovely place. 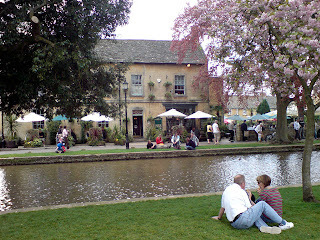 I idolise the Cotswolds. 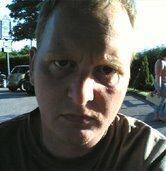 Luv the pics u guys took. Thanx, Marteen. Forgot to mention to Paddy that I recognise the Steppenwolf track. Had to Wiki it to be sure. It's so long ago.